Geothermal energy is a topic that comes up frequently, especially when people are building a larger rural property, where the economics and logistics of installing a geothermal heating and cooling systems makes more sense. The systems are costly to install, but provide a pretty aggressive reduction in costs to keep your home comfortable. There is a lot of debate in terms of whether or not geothermal energy is actually “a good investment”. Luckily, we have the definitive answer to that question… it depends. The truth is, while the payback is good it does take a long time to recoup your initial investment. Also, some homes are much more suited to geothermal energy – such as being a larger home. What about the reduced environmental impact, which doesn’t typically factor into any ROI calculations, but is incredibly important for some people. There’s a zillion resources on the web to give you more info, but in reality if you are seriously considering geothermal heating and cooling, then call a professional – they should offer a free consultation. 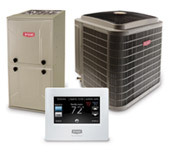 Boyle Heating, Cooling, and Plumbing is an authorized dealer for both Bryant, and GeoSmart Energy, so we are able to provide you with a couple of different options. Want to learn more, then check out the video below from our friends at Bryant Home Comfort.